A softphone is a software program that simulates the functions of a phone, allowing you to make and receive phone calls over the internet using your personal computer, tablet or smartphone. Softphones are an important component to VoIP phone services, giving you a business phone number without the need for a traditional desk phone. There are many phone system providers that have a softphone feature. One of the best is RingCentral, a leading VoIP business phone system. RingCentral offers robust, out of the box features such as multiple lines and extensions and conference calling abilities with four tiers, great for businesses of all sizes. Check them out today for more information. A softphone is an app but not a standalone device, and is typically powered by a business phone service. It’s designed to mimic a traditional phone with a local or even toll-free number that is powered by the internet, and it can replace the clunky hardware that is typically associated with traditional business phone systems. With a softphone, you’ll need either a VoIP or virtual phone provider as your business phone system—both of which use the internet to make and receive calls. Both have a lot of similarities in regards to features such as an auto-attendant and voicemail transcription, but VoIP systems support the use of physical phones while virtual phone systems are software only and can run either on your cell phone, tablet, desktop or laptop. With either option, virtual phone or VoIP, you can use a softphone app to make and receive unlimited calls, send and receive SMS messages just like you would with your mobile phone, and some allow you to manage your entire business phone system directly from the app. The best part is many of these softphone options come at a lower cost than traditional phone options and with more features. Whether you need a business number on your cell phone or a complete phone system, there will be softphone providers available for you to use. With the internet being so affordable and accessible to much of the world, there are very few instances where a softphone wouldn’t be the best choice for a small business versus a more traditional business phone option. They are typically simple to set up and easy to use, and most providers offer a variety of features that appeal to businesses of all sizes. There are numerous options for choosing a softphone provider; some offer complete VoIP business phone system solutions while others simply offer a virtual phone service with a business number you can use on your cell phone. Regardless of which you choose, they prove to be less expensive than traditional phone systems. When choosing a provider, it’s important to consider price, features, and support to determine who will be the best fit. Grasshopper, a virtual phone system that offers a softphone, is our top recommended virtual phone number system. It allows you to easily manage a business number on your mobile phone, offers an abundance of features for reasonable prices, and is offered in tiers with no per user pricing. The simplicity of the system makes it a fantastic option for both solopreneurs and small businesses. All pricing tiers include unlimited minutes, custom greetings, call forwarding, an impressive auto-attendant to answer and route calls, and voicemail transcription. What makes Grasshopper such a great option is its ease of use. The service can be managed entirely through its app and can turn your mobile phone into a business phone with little to no setup or disruption to your personal line. Nextiva is a VoIP provider that provides a complete business phone system. They offer a great balance of pricing and features with three different pricing tiers to meet the needs of all businesses. The unlimited calling options ensure you stay connected with your callers and the softphone allows you to stay in contact on the go, which are just a few of the reasons why they’re our top recommended VoIP provider. Their softphone mobile app is available for Android and Apple devices and gives you unlimited business SMS and full control of your account. Along with team collaboration with an integrated conferencing system, all of Nextiva’s plans provide integrations with document storage tools like Dropbox, Microsoft, and Google. RingCentral is another VoIP provider that provides a complete business phone system and offers a softphone. The softphone has all the features you can expect with a phone system, such as an auto-attendant, call recording and great conference call support. It’s a great option for businesses with a larger remote team that need the conference calling features and the ability to keep in touch on the go with a softphone. RingCentral offers both a desktop softphone for Windows and Apple PCs and a mobile softphone for Apple and Android phones. Much like Nextiva and other VoIP providers, it allows for integrations with productivity tools like Salesforce and Microsoft Office and is good for larger businesses and great for conference calls. For a more detailed review of softphone providers, their available features and a detailed look into their costs, we have a buyer’s guide on the best softphones for small business that further describes each provider and helps you find which might be best for your business. Check it out for more information. A typical softphone includes standard telephone features such as making and receiving calls, mute, hold, transfer, and more. However, what makes a softphone more appealing over a traditional phone line is the versatility and variability of additional features. Features will largely vary by provider and cost tier. Unlimited calling and SMS messages come standard with the business phone providers that offer a softphone. You can manage these calls with your softphone app, review your voice messages, and even receive faxes. One of the most common features of a softphone is voicemail transcription. This allows a user to have their voicemails transcribed to text and sent to them via email or SMS. Other voicemail features may include voicemail forwarding, notifications, playback via PC, desk phone or mobile, and custom greetings. When a provider offers multiple extensions or lines, it is standard for each line to have access to their own individual voicemail with the aforementioned features. Another standard feature of a softphone is conference calling and virtual meetings. This allows businesses to connect with employees and/or clients from remote locations. 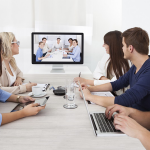 Some softphone apps support video conferences; the scope of conferencing features will vary by provider and can oftentimes be upgraded with add-ons or higher priced packages. PBX (Private Branch Exchange) gives you a private telephone network within a company or organization. It allows a business to communicate both within their company (via extensions) or with external clients and partners like a regular phone line. Most softphone providers will offer either a complete PBX system or a simplified offering of extensions and additional lines. When a company has multiple extensions, it’s necessary to have a system that can handle incoming calls and route them to the correct line. This is the main function of an auto-attendant and is often a feature seen paired with PBX. An auto-attendant has other functionalities as well, including offering pre-recorded greetings and office hours, re-routing and allowing for custom business rules to be set to suit a business’ specific needs. Auto-attendant capabilities may differ by provider. Another benefit of using a softphone over a regular phone line is the ability to track and record calls. This can be invaluable to a business in order to measure customer responses, train employees, keep a record of suppliers, distributors or partners and much more. Many softphone providers also offer the ability to see an analytics dashboard in order to track call metrics, which are then either integrated or can be entered into CRM programs. Softphones are meant to mimic a traditional phone but with more convenience, which is why the pros include having a no-hassle setup, low cost, user-friendly interfaces, mobility and more. While the accessibility of a softphone is what makes it such a great option for many businesses, its biggest con is the reliance on the internet and the devices it’s used on. Quick installation – Most softphones are downloaded via a website or app and require no setup of equipment or phone lines. Budget-friendly – Due to the lack of hardware, costs are often less than a solution that requires expensive equipment. Supports a remote team – Softphones are almost always available via a mobile device, which means it can be used by your team anywhere in the world without worrying about getting equipment set up in remote offices. No hardware needed – There’s no hardware to install or equipment to set up with a softphone. Reliance on the internet – A softphone is operated over the internet, which means it relies on a good connection. If your internet connection is unreliable, it may cause issues for your softphone experience. Reliance on mobile – If a user is often on the go while using their softphone via a mobile device, they will need to ensure they have a reliable device and could be affected by battery life and/or equipment crashes. Desktop versions require a headset – If a user wants to use a softphone via their desktop computer, they may need to purchase a headset or microphone, which is an additional cost and could be a nuisance to some. There is one main alternative to a softphone should a business decide the solution is not right for them: the traditional desk phone. This option may be better suited to a business with one or a few physical office spaces that are uncomfortable with relying on an internet-based phone service for their calls. A desk phone is essentially the hardware equivalent to a softphone. It will require the setup of equipment and phone lines but may be more familiar and comfortable for those used to a traditional phone system. If internet reliability is not the reason for choosing a desk phone over a softphone, there are also desk phone options available that use VoIP technology. Can I Use My Softphone Overseas? Yes. You can use your softphone anywhere with a stable internet connection. In fact, 8×8 is a VoIP provider known for its great (and often free) international calling. Check them out today for more information. How Do I Make International and Long-distance Calls? Calls are made the same way you would on a traditional phone—all you need to do is dial the number. Pricing and plans may vary by provider. Do I Own My Assigned or Chosen Phone Number? As long as your account is in good standing, yes, the number belongs to you and/or your business. You can port your number to different providers if your business outgrows the phone system. Zoiper is a VoIP system that integrates with your website or blog and uses the internet to make and receive calls. It uses a web-based softphone app to handle your incoming calls from customers. Cisco Softphone is a desktop-based phone that uses your PC and internet connection for calls and SMS messages. You can also make video calls to other Cisco softphone users, giving you an integrated conference calling system. A hard phone is a physical phone that works with your VoIP phone service for incoming and outgoing calls. It resembles a traditional phone with the only difference being that it uses your internet for calling. Softphones are a great communication solution for businesses of any size, with particular appeal to small business and remote teams. They are easy to use and set-up, require no hardware, come with plenty of customizable features, and allow for a high degree of mobility. With the range of options available, it’s important to first understand your business’ needs, must-haves and budget before beginning to shop for a softphone provider. To make this process easier, we have highlighted RingCentral as a fantastic option for small businesses. RingCentral offers four tiers and robust functionality out of the box. It’s a great option for businesses of all sizes, especially those that are growing.